After a couple of months exploring other projects and generally regrouping before the climb to the summit (and plenty of work), today saw an opportunity to head out in London to meet Stranger 98. That was Mai. Living in London whilst she studies social policy at LSE, we chatted about her native Tokyo and the various contrasts. It made me smile to hear her explain that she missed some of Tokyo’s energy and bustle. So often I’m used to hearing visiting strangers talk about London’s busyness, so it was a super jolt of reality check to remember the bigger, wilder, urgent world of which we’re just a small part. Mai had a super calm and poise waiting for a bus. So much so that I almost didn’t approach her, fearing an encounter might be cut short by its arrival. However, with a background identified just 10 yards from where she was waiting, I had to intrude upon her afternoon. 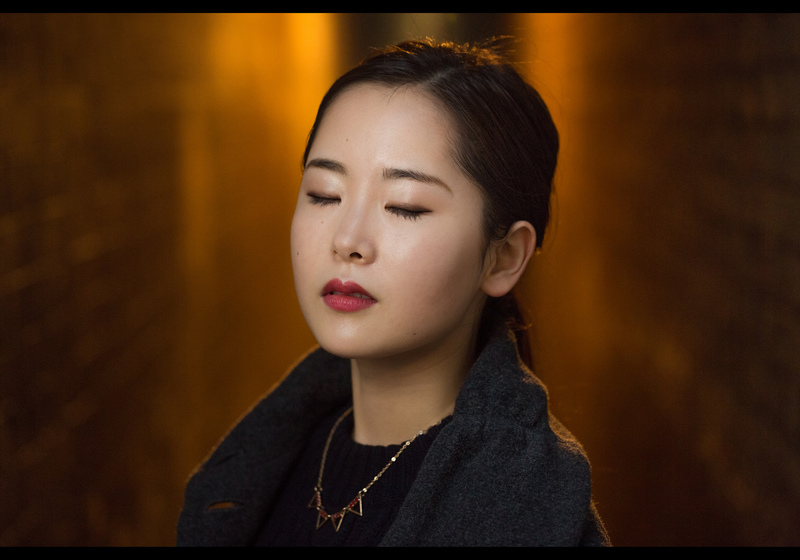 The background is the incredibly narrow Catherine Wheel Alley – a tight slot canyon style street lit by sodium vapour lamps, whilst Mai in the entrance is lit by the fading winter light and – yes – a little zap from a white shoot through umbrella. Our conversation cut short by the arrival of our bus, we shok hands and whizzed our separate ways. Mai had a super, bright smile in the first few frames, then showed a more dangerous Vogue expression – both fantastic, but this shot between the others, taken really by mistake, stood out for me. Eyes closed it felt like she was floating in the sweep of light, lost in thought. Mai – どうもありがとうございます! I hugely appreciated your time and taking a risk with the bus! Please do send me an email or ping me a note on Facebook, and I’ll send you all your pictures right away! There’s a black and white version here. This is portrait #98 of my 100 Strangers Project – check out the group page and get involved. Info for Strobist; There’s a Canon 600EX-RT camera left in a white shoot through umbrella, about 45* up and yet only just off axis. I only half opened the umbrella, to both prevent the wind ripping it up the alley way, and to try to prevent too much light spilling onto the orange glow behind Mai. It’s trigger by an ST-E3-RT on ETTL at -2 stops, with a small silver reflector just out of shot, held by Mai. Hope everyone is having an incredible day!